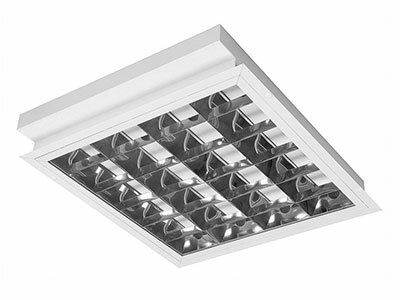 Recessed luminaires for mounting into ceiling grids. Body made of steel sheet finished with powder coat RAL 9003. Luminaire´s optics made of parabolic louvre and thermal, shock resistant tempered glass in aluminium profile with polyurehtan sealing gasket in coverin IP 54 and IP 65.